Nothing is more refreshing than a dip in the pool, especially when it is your own pool, in your own backyard. It beckons you the moment you get home from work to just take a plunge and those broad strokes through the water just melt the day’s stress away. Pools, for all their virtues, unfortunately do not come maintenance free. People tend to overlook that detail when shopping for a pool, then getting it installed. Even in a cold-weather state like Connecticut, when pool owners can only use the pool about half of the months in the year, it still does not deter people from buying and using a pool. There is maintenance involved when you cannot use your pool year-round, as you must properly winterize it. But, the months that you use and enjoy your pool, you must diligently maintain the water quality to keep it bacteria-free and pristine for swimming. Unfortunately, to keep your pool water safe and clean requires the abundant use of chemicals. It is a catch-22 because you may eschew toxic chemicals in and around your home, but you certainly cannot go without keeping your pool clean and sanitary. Chlorine is the primary chemical used to keep pools clean, but the Environmental Protection Agency, or EPA as it is commonly known, advises that chlorine irritates the skin, eyes and respiratory system of all pool users. They state, as to adults, chlorine exposure has also been linked with other health problems including bladder and rectal cancer and, possibly, an increased risk for coronary heart disease. They further go on to state that children who swim frequently in chlorinated pools may have increased risks of developing allergies or asthma. After you read the above paragraph about how dangerous chlorine may be to your health, you might want to just grab a lounge chair and soak up the sun on the pool deck. But beware, because the EPA would like you to take note that chlorine is such a potent chemical that it can actually escape from the water and enter the air under certain conditions. It then reacts with other chemicals in the air to form chloride salts. Did you know that draining your chlorinated pool at the end of the season is deemed toxic to local waterways and puts plants and animals at risk? One means of abandoning the sparkling clear, but chemically treated, pool is simply to stop using chlorine and have saltwater instead. Some homeowners, in the warmer states, even use ground crab shells to keep the water pristine. The apparatuses used to keep a salt water pool clean would be a salt chlorine generator and ultraviolet lights, or a high-efficiency programmable pump. An automatic pool cover helps eliminate evaporation when the pool is not in use. To keep the pool a comfortable temperature, it is solar-heated. Salt is added to the pool water when it passes through the filter and return lines then goes through a salt-cell generator. It then passes through a pair of electrodes and gets sparked, which causes the salt to break down and produce chlorine. The salt never evaporates thus obviating the need to purchase chlorine tablets. The biggest plus in this “green” pool maintenance is cutting out the chemicals, like chlorine, of course, but don’t discount the benefits like a lower electric bill due to the programmable pump contributing to energy efficiency. The end result is: an environmentally safe swimming pool without chlorine irritation like itchy skin, no green hair and an enhanced swimming experience. Often byproducts made from crab shells and formulated into pods are dropped into the pool skimmer basket to clear up cloudy water. They are natural products and not made from chemicals. Besides salt generators, ultraviolet light systems may also be used to sanitize backyard pools. Not only does it cost less than the traditional means of keeping your pool clean, but it is much safer than being subject to harmful chemicals. The ultraviolet lamp system is installed in-line with pool equipment and uses a UV lamp to neutralize micro-organisms like bacteria and algae. 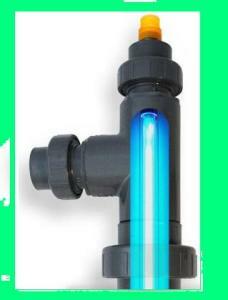 The UV light eliminates any kind of bacteria in the water. The UV setup decidedly is more costly; approximately $850.00, but ultimately you will see result in your energy bill as well as less scum and less chemicals. As the water travels through the filter it is hit by UV light on its way back to the pool, thus preventing any pathogens from reproducing. A device for your swimming pool that will save you up to 50% on electricity and use 80% less harmful chemicals is a solar-powered filter to keep your pool clean and sanitary. This device is a powerful, solar pump motor which works off of small solar cells and provides high-efficiency pump output. It works just as efficiently as any regular filter which utilizes chemicals and it strives to kill off bacteria, algae and viruses. The use of mineral ions are 1,000 times better than chlorine alone and ionization is the easiest way to disinfect your pool. There is no installation necessary, and you just float this device on the top of the water in your pool and soon you will see crystal clear water. The clarity of the water is such that it actually exceeds the EPA standards for drinking water. It is good for salt water pools, and its chlorine generator stays cleaner than any other method for keeping the pool sanitary, plus there are no calcium or mineral deposits. Unlike other methods for keeping the pool clean, the solar-powered filter guarantees a return on the initial investment within months of purpose. It may also be used for spas and hot tubs.